Welcome back to the next blog in the SAP S/4HANA Cloud Two-Tier ERP blog series. In the last blog on “Intelligent ERP Update: SAP S/4HANA Cloud 1805 Release updates for Two-Tier ERP” we discussed about latest and greatest 1805 highlights of our next-generation, intelligent cloud ERP solution for Two-Tier ERP deployment, we are happy to take the tradition of blogging series to the Two-Tier scenario for analytics, what motivates enterprises to run independent ERP systems in their subsidiary and what advantages S/4HANA Cloud brings to the table with Analytics and Integration capabilities. This blog will cover the latest updates with deep dive on analytics topic, and you can find all the links in this collection for documentation. In this blog, let’s understand how the latest product features of SAP Analytics Cloud enrich the Two Tier ERP accelerators for the analytics content providing Integration between SAP S/4HANA /SAP S/4HANA Cloud and SAP Analytics Cloud. Content library to access the accelerators of this package. On the General tab page, you can find additional information about this package. As you might know, SAP Analytics Cloud is a next-generation software-as-a-service (SaaS) solution (https://news.sap.com/sap-expands-user-experience-across-all-analytics-platform/) that consolidates all analytics functionalities for all users in one product. SAP created a highly differentiated solution “SAP Analytics Cloud” which is the intersection of BI, Predictive and Planning. Built on SAP Cloud Platform it delivers an enterprise-wide access to analytics delivered through a high-performing and reliable public cloud experience. Check out the video below for a quick overview on top analytics innovations released for Two-Tier ERP. The 3 approaches for data integration with Two-Tier ERP scenarios with SAP S/4HANA Cloud. Data extraction covers the cross-system analytics scenarios. Data replication covers the Operational cross-system analytics scenarios. This blog will cover the Data replication scenario using Integration between SAP Analytics Cloud and SAP S/4HANA Cloud (Subsidiaries) and SAP S/4HANA (HQ) for analytics and planning scenario’s. SAP Analytics Cloud provide pre-delivered analytics content for finance, manufacturing, procurement. Analyze your data using Analytics capabilities for companies running in a Two-Tier ERP deployment model. SAP Best Practices package delivers best practice methodologies to integrate financial results from SAP S/4HANA Cloud into SAP Analytics Cloud, Real-time integration between S/4HANA Cloud and SAP Analytics Cloud, plus retract Plan data back into SAP S/4HANA Cloud. Two Tier ERP Accelerators for analytics are provided to combine the data set and visualize it using SAP Analytics Cloud and SAP Digital Boardroom. Lets understand how Real-time integration can be set up using SAP Analytics Cloud and SAP S/4HANA. Real-time integration can be set up with live data connections to an SAP S/4HANA systems using the Path and Cloud connection types. Users can build stories based on released CDS views or leverage own queries created by you. For list of released CDS views, see CDS Views. Only CDS Views containing the @Analytics.query: true annotation will appear in SAP Analytics Cloud. The Path connection type is recommended in the following instances where you already have a reverse proxy set up on your local network and must access SAP Analytics Cloud through it. You want to connect to an on premise SAP S/4HANA system. Use this connection type if you want to connect to data on an SAP S/4HANA Cloud Edition system. SAML SSO connection between S/4HANA Cloud Edition and SAP Analytics Cloud. For SAML SSO KBA 2518900 – How do I connect SAP Analytics Cloud to SAP S/4HANA Cloud Identity Provider (IdP)? Real-time integration between SAP S/4HANA Cloud and SAP Analytics Cloud. SAP Real-time Financial Analytics for SAP S/4HANA Cloud enables analysts or planners to dive into SAP S/4HANA Cloud using a real-time connector. Accelerators include a prebuilt set of LIVE analytical dashboards, key performance indicators, and P&L/Balance Sheet reports (Best Practice Analytics scope item 1U8). SAP Financial Analysis for SAP S/4HANA Cloud enables analysts or planners to analyze trends, variances, and growth rates for both Actuals and Plan in SAP Analytics Cloud. Accelerators mirror the content in Real-time Financial Planning for SAP S/4HANA Cloud (Best Practice Analytics scope item 2IJ). SAP Analytics Cloud allows you to connect to an SAP S/4HANA Cloud system to replicate data to a analytics model enabled for planning. After creating a connection in SAP Analytics Cloud, a query can be configured to import master and transaction data to SAP Analytics Cloud. A Communication Arrangement in the SAP S/4HANA Cloud system. The SAP Analytics Cloud model need to created new or imported. Configuration, access to the following system is required i.e. User access for SAP Analytics Cloud with Administrator roles assigned and User access SAP S/4HANA Cloud Communication Arrangement user access to appropriate financial CDS views and appropriate Fiori tiles ex. P&L – Actuals and Trial Balance. In Modeler – Data Integration – dimension mappings is performed and adjusted as required for the queries needed for master data upload in SAP Analytics Cloud. Jobs to Import the above Master data to be scheduled via SAP Analytics Cloud Job scheduler will be available in future. It is recommend that user complete all the steps for a single dimension, then repeat them for the remaining public dimensions. Process of loading transaction data to the SAP Analytics Cloud model start with clearing out the transaction data from the SAP Analytics Cloud Model to prepare for initial loading. SAP S/4HANA Discovery service based query is designed to allow importing of transaction data ex. P&L finance data set to the SAP Analytics Cloud Model. 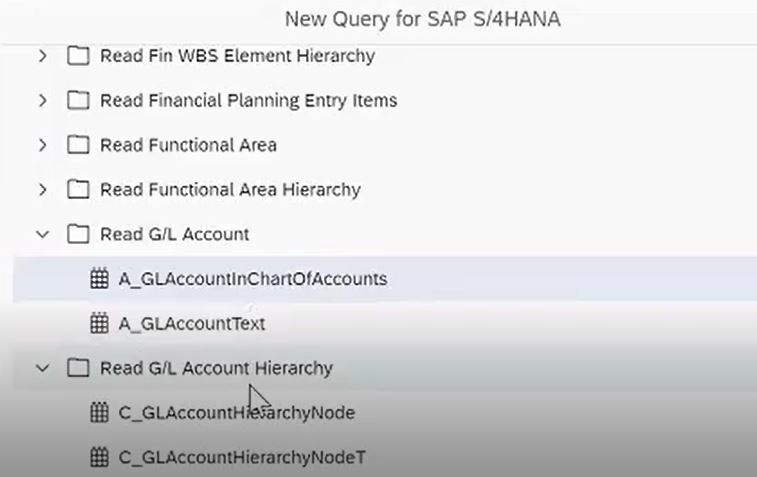 SAP S/4HANA Cloud transaction data import can be achieved using SAP S/4HANA Discovery service and creating new query for SAP S/4HANA ex. A_JournalEntryItemBasic. Query based on requirements can created in SAP Analytics Cloud to support loading of transaction data ex. P&L to the SAP Analytics Cloud model. After the query is created to load transaction data ex. P&L, data wrangling is required to map and convert fields contained in the query to related dimensions within the SAP Analytics Cloud model. 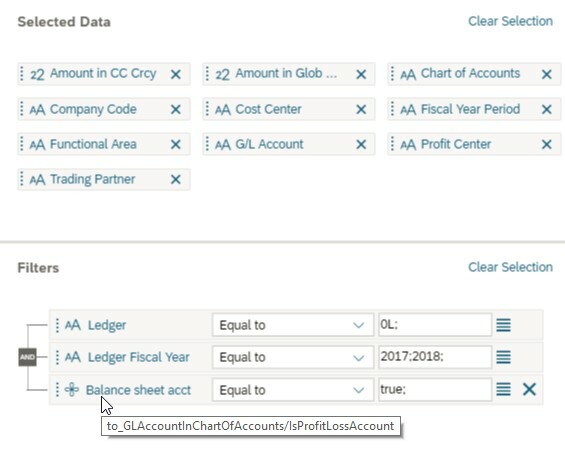 SAP Analytics Cloud Model can import data using Connection Type – “OData Services” and selecting the appropriate OData service URL in Import Data from OData query can be coded into Freehand SQL input box After the query is created to load balance sheet transaction data, data wrangling is required to map and convert fields contained in the query to related dimensions within the SAP Analytics Cloud model. Freehand query is utilized to import transaction data ex. balance sheet to the SAP Analytics Cloud Model. Card View screen allows to have all Dimensions and Measures mapped. attributes do not need be mapped here in card view. each of the cards to make sure the mapping has been performed and the status is complete. Finish Mapping step allow to start the import process to load transactional data in SAP Analytics Cloud Model. After loading transaction data in the SAP Analytics Cloud model, it is necessary to confirm the transaction data from SAP Analytics Cloud matches the data in source system ex. SAP S/4HANA Cloud for reconciliation which can be done using Fiori Tiles in SAP S/4HANA. Stay tuned for more updates in the next quarters!